In the moments after Green Bay - the only publicly owned sports franchise in major US sports - won the Superbowl a few weeks back, my friend and Detroit native Dr. Juni texted me. Her message had nothing to do with the game, but with a car commercial that was the center of post-Superbowl ad buzz - Chrysler's "Imported from Detroit" commercial, featuring Eminem, a gospel choir, and a deep-voiced narrator pontificating not about the virtues of their cars but about the virtues of the city that produced it. I am not a car person in the least, but the defiance and production values, combined with a dig at the writers who use Detroit as a punching bag ("it's probably not the [story] you've read in the papers, by folks who've never even been here"), struck a nerve. Even if the ad never acknowledges how Detroit's struggles are linked directly to the Big Three auto companies' - Chrysler, GM and Ford - failure to adapt and change, and the entire region's overreliance on one industry, or the role of the car and the automobile in producing a wholly unsustainable and woefully unequal settlement pattern in the United States, the fierceness is welcome, even if it comes from a car company. If you look closely at the ad, you will see another image buried in the jumpcuts, a brief glimpse of Diego Rivera's legendary Detroit Industry murals from 1932-33. 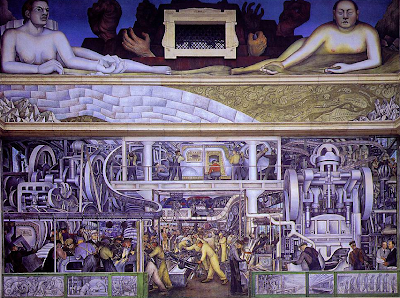 The murals, commissioned by Ford and the Detroit Institute of Art, were controversial from the moment they were unveiled, for everything from the nudes ("pornographic") to the depiction of a multi-racial workforce, from Rivera's Mexicanness to his leftist politics. But it is not the controversy which I care about, but the images of workers during a critical moment in US history. Just two years after Rivera left Detroit, the United Auto Workers was founded after a struggle within the American Federation of Labor. A series of 1936 strikes, and an intervention by Michigan governor Frank Murphy, helped push General Motors to the bargaining tables and GM unionized in 1937, followed quickly by Chrysler. Ford, despite its love of radical Mexican muralists, fought bitterly against the UAW, using intimidation, espionage and violence to put down the unionization efforts. It wasn't until 1941 that Ford would agree to a collective bargaining agreement with the UAW. We seem to have reached another watershed moment in the struggle for workers rights and the collective dream of middle class security in the United States. Right-wing Republican governors across the US, led by Scott Walker in Wisconsin, are aiming not only to balance their budgets by reducing public employee salaries and benefits - some of which are needed or justified - while simultaneously reducing corporate taxes in the name of "job creation", they are attacking the very institution of collective bargaining. 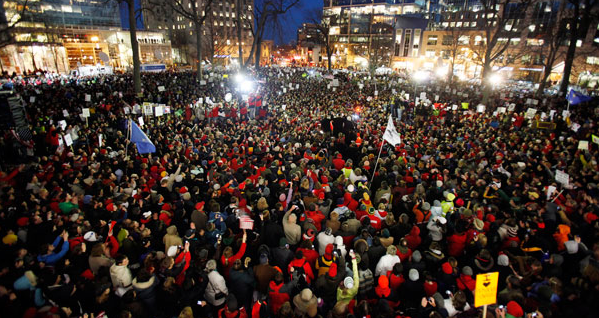 This attack has fractured the state of Wisconsin, and seen an unprecedented outpouring of anger and support for worker rights on the streets of Madison, Columbus and other midwestern capitals. Walker is the antithesis of former Michigan Governor Murphy - rather than work to bring workers and management to the table, Walker is keen on throwing the table out of the window. At a time when the world is rightly transfixed by the sea of protest filling streets and squares and plazas of the middle east, we are apt to ignore or forget the tens of thousands marching in sub-freezing temperatures in Wisconsin. But one wise marcher in Egypt has noticed, and recognized the link between the two. The revolutions in Egypt and Tunisia were not just about democracy and free speech, but about the economic misery imposed by corrupt, autocratic and oligarchic regimes on the middle and working classes. As we watch events unfold in the Middle East and the Midwest, it is critical that we remember how critical cities are as sites of protest and not merely production, and how these two things are linked. The Detroit miracle of the Big Three would never have happened without the struggles in the streets of the UAW and other unions to establish a social compact that guaranteed a more equitable share of the spoils of growth (at least if you were white). It is this compact that has come undone, and without it, there will be neither production nor peace in the Motor City, the Windy City, The City of a Thousand Minarets or any other metropolis. Credits: Image of Diego Rivera mural cribbed from marxist.org. 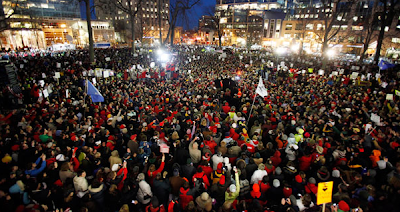 Image of Wisconsin protest from politico.com. 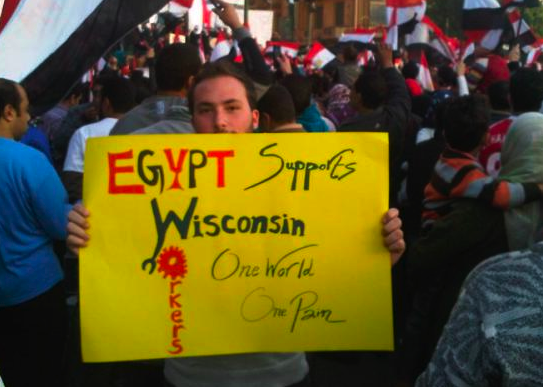 Image of an awesome Egyptian from zackfarley's Twitpic (where else?). Chrysler video is an advert on the tele and the youtube.